Under construction count-down,Extended version . This web program is the extended version of my previous under construction program. Thisversion has most of the same features but with cool AJAX and JQuery codes that makes the program lot more user friendly. And the other big change is, you do not need a database to run this program on your server successfully! New admin panel design New design supports lot of the real-time AJAX and JQuery animations that are new in this program. Easy percentage complete box very cool and easy to update percentage complete box with up and down button to change values. Better security Admin panel code is not visible to others without correct password. Not even in the source code of the website. AJAX and JQuery Lot of cool ajax+Jquery effects that make this program a seamless experience for admin. to go in a matter of few minutes. No phpmyadmin hassles! Social media integration Facebook and twitter can be very easily integrated into this page for you visitors to see while the website is under construction. Email Validator AJAX driven email validator, that also acts to test correct admin panel password. Sneaky admin panel Email address box acting as the login box for admin, a well disguised way to access the backend of the program. Cross browser compatibility Compatible with all of the currently used web browsers. Easy to customize Contain documentation and photoshop source files to make the customization of this program very easy. Try out the cool admin panel! Enter “admin” in the email address box and press “get updates” to get into the admin panel. * Please note some of the features (social media links, currently working, and emailing) are disabled to avoid unnecessary user input! 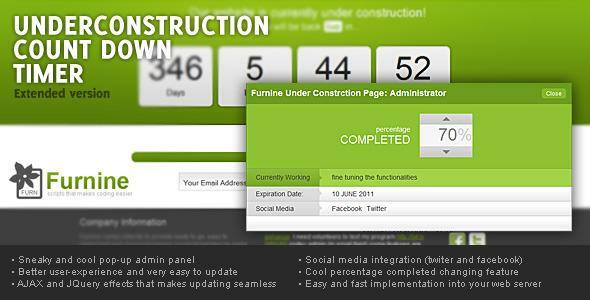 Share the post "Under construction count-down"